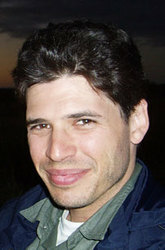 Max Brooks is considered by many to be one of the world's foremost Zombie preparedness experts. As we all know, the world we live in has become a rather scary place, and the global increase in the number of Zombie attacks isn't helping matters any. According to the Office of Homeland Security, Brooks is the preeminent authority on dispatching the relentless, flesh-eating armies of Zombies that seem to be everywhere these days. Brooks' latest release, The Zombie Survival Guide: Recorded Attacks (2009), is the graphic novel that fans demanded: major zombie attacks from the dawn of humanity. Recorded Attacks reveals how other eras and cultures have dealt with--and survived--the ancient viral plague. By immersing ourselves in past horror, we may yet prevail over the coming outbreak in our time. The Zombie Survival Guide, Brooks' first release, is your key to success against the hordes of the undead that may be stalking you right now. The book is the result of Brooks' tireless search for both the living dead and ways to eradicate them, which has taken him to over 30 countries and territories in Europe, Russia, Latin America, the Caribbean, the Arctic and Sub-Saharan Africa. A New York Times best-seller, World War Z: An Oral History of the Zombie War (2007), tells the story of the world's desperate battle against the zombie threat with a series of first-person accounts "as told to the author" by various characters around the world. Publishers Weekly called the novel "surprisingly hard to put down." Born in New York City in 1972, Brooks' introduction to the living dead began with a traumatic childhood incident, an incident he still refuses to discuss. Since that time, he has devoted much of his life to the study and development of anti-ghoul security. He is, at present, the leading Western student in the Afro-Caribbean martial art of Mkunga-Lalem, the world's oldest and most effective anti-ghoul fighting skill. After working for the B.B.C. in Great Britain and East Africa, Brooks began writing The Zombie Survival Guide. A former writer for Saturday Night Live, he lives in New York City with his wife, Michelle and their miniature dachshund, Maizey.